Twitter has been trying to make it as easy as possible to work with photos within their ecosystem as of late. As part of this initiative, they’ve just revealed a new update to their mobile versions. 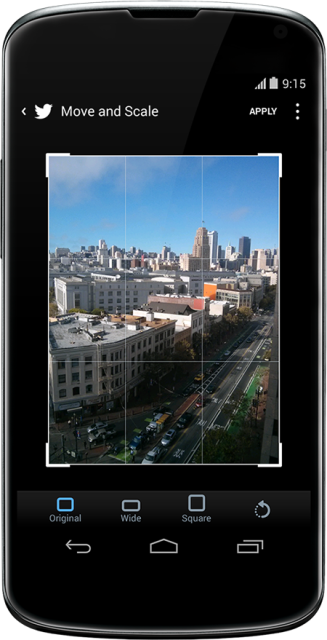 Now you can crop your photos by selecting an aspect, such as square or wide. You can rotate an image before you share it to make sure it fits nicely in your Tweet. And when you upload a photo of people, you’ll see a reminder to @ mention your friends so they can see your photo too. In addition to the focus on photo sharing, the update also brings new functionality to the home timeline. Trying to refresh the timeline when there are no new tweets to display will provide a mixture of trending topics, follow suggestions, and recommended tweets. For those in the United States, there will also be tidbits relating to sports, news, and television. These updates are available now on Twitter for Android, and will be coming soon to Twitter for iOS.